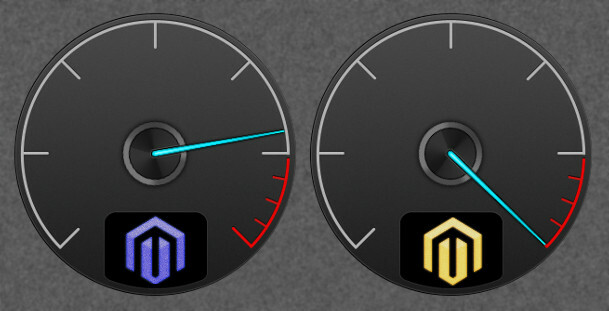 Recently I made a speed test between Magento Community Edition (ver. 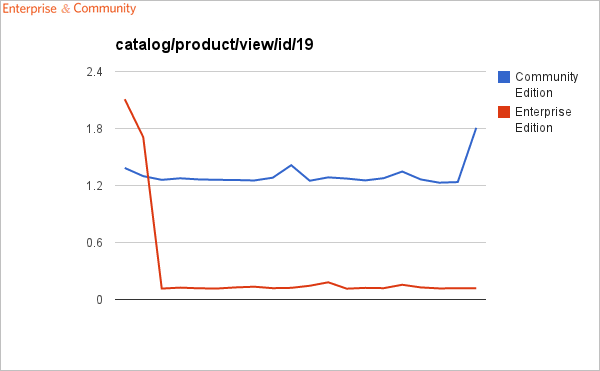 1.6.1.0) and Magento Enterprise Edition (ver. 1.12.0.2). Here, I will show you the results of that test with short explanation of the testing procedure. 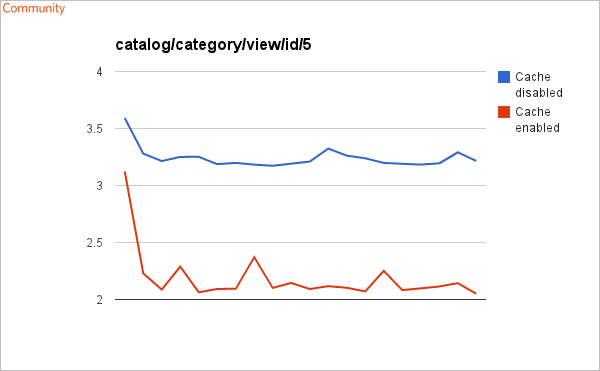 For the purpose of testing, I made a little modification in index.php file from both of magento instances. at the end of the index.php file. That allowed me to measure and print the execution time for each request (time is displayed as a floating point number in seconds). The test was separated in three parts. 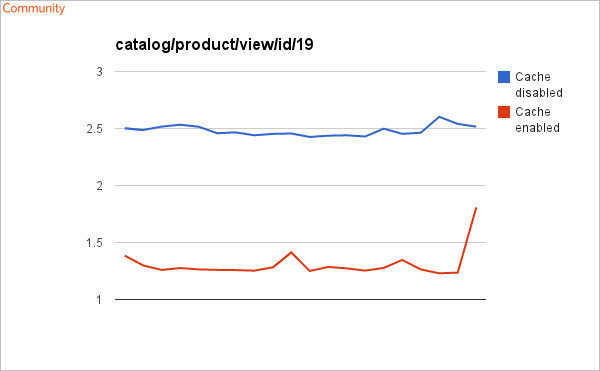 First part was to measure response time for CMS page (cms/index/index in my case), second part was category page (catalog/category/view/id/5) and the third part was product page (catalog/product/view/id/19). 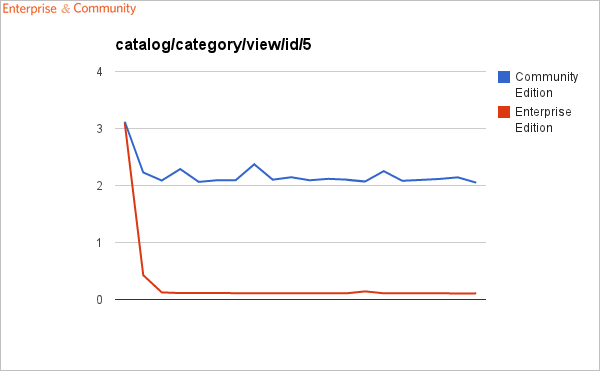 Magento Community Edition was tested both with and without cache enabled. Enterprise Edition was tested in three variantes: first was with all cache disabled, second was with all cache enabled except full page cache (like the cache from Community Edition), and the third was with all cache enabled. Final comparison is derived from previous tests for cases when all cache available is enabled, both for Enterprise and Community edition. Whole test is created at the same machine with default Magento installations with sample data. There has been 20 requests per each test case. Tests are automated using Selenium testing system. Magento EE is very expensive. For normal use I can not see any difference, maybe in performance, that’s all. magento enterprise is too expensive. 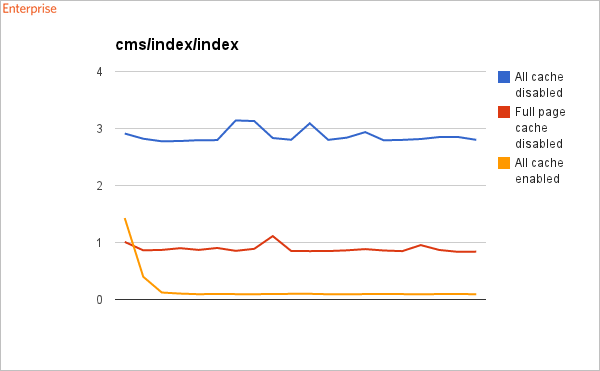 and I didn’t use any Full Page Cache in Community Edition too.But I think my magento is fast enough. Can you tell me, the specifications of the server??? Hi @Sebas what FPC have you used? I’ve seen this extension (http://www.magentocommerce.com/magento-connect/catalog/product/view/id/15389/) that has been released recently which offers FPC on CE and it’s Free with hole punching, does anyone here have any experience with it? I shall be trying it next week on a site and will post back my findings. What magento theme was used for EE and CE for testing? Maybe EE Theme has less blocks on pages then CE? How you may explain difference in results without cache? Looks like if CE develop in proper way it’s no need any FPC service, because generation with cache show results near 1 seconds. I have never used magento enterprise because no client want to pay for it. Too expensive for some additional features. It is not the speed that you buy with EE, it is mostly features. If you don’t need those, you should go community, however if you plan to utilize any of EE features then go EE. Idea of having EE features on top of CE by using extensions is quite naive unless you plan to code those extension by your team (which btw needs to be very good) which would raise the cost of CE additional development much more than purchasing EE. At least that’s what counts if you are going for some serious business. Community with full page caching would get the same results as Enterprise with full page caching. Comparing community without FPC with enterprise with FPC is not a good way to approach it, using your community + cache – FPC vs enterprise + cache – FPC is more far comparison. We run lightspeed extension and it gives same results as enterprise FPC. -> one off $500 extension cheaper than $14,420 annually. though of course magento enterprise has more stuff, but for $14,420 annually, i’d rather get community and hire a company like inchoo.net to deck it out and i reckon you would get better support from development company. Magento ‘enterprise’ support is code word for $500 per hour ‘support’ from a $10 per hour outsourced programmer you don’t work with face to face. Very interesting. The results are not spectacular, though. Full page cache is great if you use a default magento installation, but when the client requirements start to grow, cache needs to be re-thought and Varnish works much better for this purpose. Installing varnish and ajaxifying the blocks that don’t have to be cached… that’s the way to success! Sebas your page is definitely fast. If you decide for fpc extension make sure hole punching is supported. Several extensions support this. fpc, apc, compiler and magento cache enabled. Shared server with 2gb ram. Using a FPC module on CE gets you same/better performance. @MilenPetrov It’s very likely that this option has no effekt in your store because your server doesn’t support it. Do you use a Zend server? I didn’t use any Full Page Cache in Community Edition. Zvonimir, I am curious whether when you did your tests did you enable full page cahces on CE 1.6.1 from System->Configuration->Advanced->System->External Full Page Cache Settings, and how ebnabling/disabling this option affects the results. 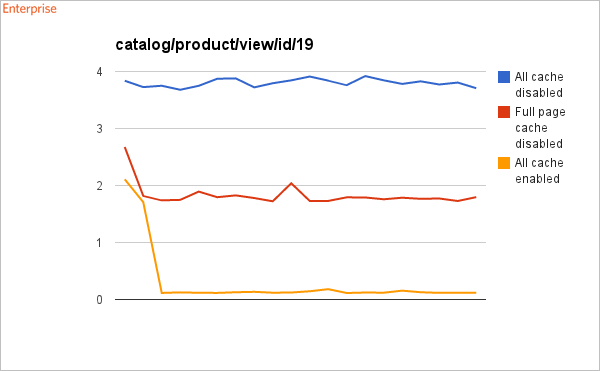 Please put a product in your cart, login or change sort order of category page in order to drop out of full page caching. Your test result will differ. I’m happy with ce and extensions like zoom cache and varnish. I notice you did a review on the tinybrick lightspeed extension. Can you do a post which compares the Enterprise Edition Full Page Cache vs the LightSpeed Full Page Cache? Lightspeed features holepunching, but how does EE FPC tackle the issue? Also in CE under Advanced > System, there is an option for External Full Page Cache Settings but apparently this only works with Zend Server? As that features Zend Page Cache, which is the controller to have this feature in CE. Could you explain more about this too please? Great post, however the graphs are not made for easy comparison, some range 0-6 seconds, others only 2-4seconds. 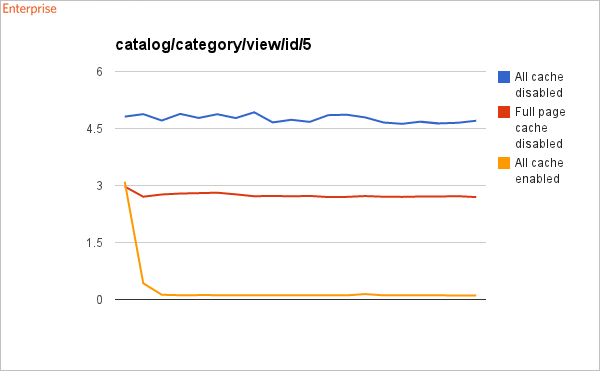 So it doesnt fairly show the speed difference, if you look at the CE Category page graph, and compare it to the EE Category page graph. EE is actually slower than CE, but your graphs are done wrong to not show this. Please make all the graphs range 0-MAX, so if you have one graph 0-6 seconds, make them all like this so you can clearly visually compare, otherwise, don’t do graphs, and post a text table instead. Never trust a statistic not created by yourself. If you compare the load-time of a product-page without FPC, CE will be faster in your tests (as Colin mentioned). But this graphic is missing. I have good experience with http://www.mgt-commerce.com/speed-up-magento-by-full-page-cache.html (i have nothing to do with this). This best thing for community is to spend a little bit of money and get FPC system for community. This will save you a lot of money since it’s around $350-500 for a good one with support vs $12k a year for EE. EE is not worth it if it is just for the speed. It’s the things like flash sale abilities that make it $12K but even that is hard to justify. Is there a way to create this full cache on CE with a extension? How does this full cache meganism work? Tests are created on my local machine which is pretty slow (not on a real server). 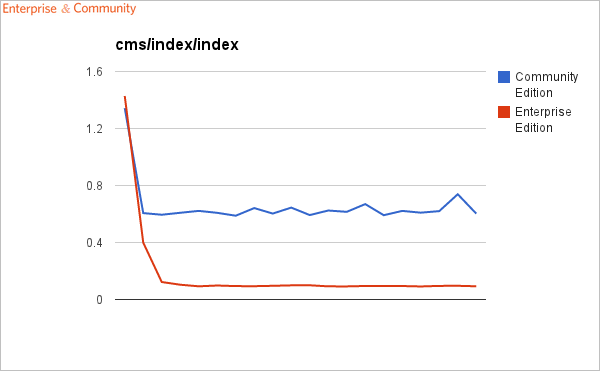 There are also many other ways to speed up your website besides default Magento cache (eg. APC). So, if you configure your server on a right way, Magento Community Edition should work great! EE is basically CE with some additional modules, right? Obviously the FPC is going to be far faster than CE without it, but fortunately there are some decent FPC modules for CE out there. 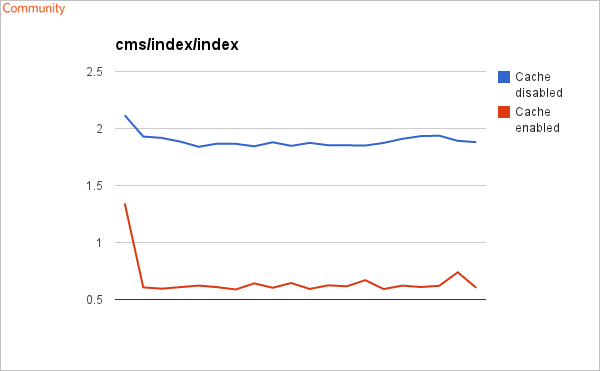 CE is considerably faster with no caching vs EE with no caching which shows that EE is basically the same, just heavier (larger config and layouts, more event observers, etc). Even worse, huh? I realize Community edition is a free product but IMHO Magento ought to fix this discrepancy. After all, it only reflects poorly on them if one of their products is sub-standard. numbers are given in seconds. — Community edition is 7.86814269612009 times slower (1.90812920331953 s). — Community edition is 4.28337550284117 times slower (1.00306845903396 s). — Community edition is 3.68145523419705 times slower (0.478762114048003 s). Can’t say I’m surprised but its a little disappointing to see. Sure the paid edition should have more features etc. but the community edition is dreadfully slow and apparently Magento aren’t too concerned about fixing that? Lame.